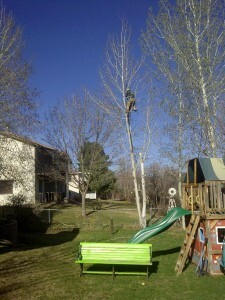 Animas Valley Arborist places quality tree care at the highest value. We offer appraisals and consultations to define the scope of each job, diagnose any tree diseases, and determine the best course of action based on the needs of the property owner and their trees. We are truly concerned about your trees because we value the benefits they add to our environment. Our mission is to provide trustworthy tree care to all of our clients. In addition to pruning, tree planting, maintenance, and insect treatment, we also provide chipping, stump grinding, cabling, transplanting, air spading, and vertical mulching. We offer every service you can imagine for your trees, which also includes holiday decorating if requested. Contact the location nearest you – Durango, Farmington, or Cortez – to receive the tree services you need to maintain a lush, green, and healthy landscape around your home or on your commercial property.